Just in case you were wondering what clothing items I will be attempting to pick up, the list is as follows: the Harry Potter gone femme fatale cardigan, the retro infused pencil skirt and pants, the divine leather shirt and the playful printed maxi dress. Wish me luck ladies, and happy hunting to you! 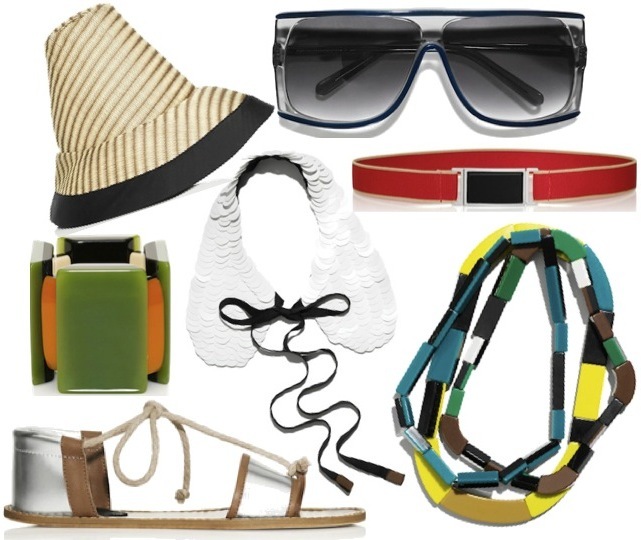 With most accessories costing under $50 and clothing items under $150, Marni for H&M is sure to cause another record fashion frenzy. View the entire collection here. OMFG are those sunglasses really coming out??!!! i can't believe it, those are like thee perfect pair!! great updated post! so EXCITED for this collection, can't even deal!! I was one of the crazy people who camped out for Versace for H&M, and was on e of the first people to get inside... def. doing the same for Marni! H&M does it again! Great blog! I've got this hat in my last post, love it!